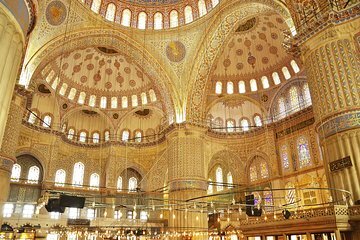 Discover the mighty monuments of the Byzantine and Ottoman empires, as you journey through Istanbul’s vibrant past on this full-day small-group tour by luxury minivan. Explore the infamous harem and dazzling treasury of Topkapi Palace; stand in awe beneath the magnificent dome of Hagia Sophia; and learn how the Hippodrome was once used for chariot races. With numbers limited to 12, you’ll enjoy personalised attention from your guide, who can help you haggle for souvenirs in the Grand Bazaar, or offer insight into religious traditions as you visit the Blue Mosque.